Spain won the World Cup for the first time when they beat Netherlands 1-0 after extra-time thanks to a goal by midfielder Andres Iniesta [ ]. 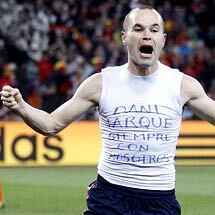 Iniesta fired home the winner after being put through in the area by Cesc Fabregas [ ]. Keeper Maarten Stekelenburg [ ] dived to his right and got a hand to the ball but could not keep it out. The defeat was heartbreaking for the Dutch, who were down to 10 men after John Heitinga [ ] was sent off in extra-time. It was their third World Cup final loss, being beaten in 1974 and 1978 too. European champions Spain had looked the more assured early on in the clash at Soccer City as a nervous-looking Dutch side ceded territory to their slick opponents. Stekelenburg was forced into a save after five minutes when Sergio Ramos [ ] headed a Xavi [ ] cross goalwards while Spain forward David Villa [ ] crashed a volley into the side netting with the goal looming. But a series of freekicks and bookings, including two strong challenges by Dutch midfielders Nigel de Jong [ ] and Mark van Bommel [ ], shook Spain out of their rhythm and stopped them from producing the swift-passing game that got them to the final. Netherlands offered little in attack and the nearest they came to a first-half goal was a bizarre incident when Gregory van der Wiel [ ] attempted to give the ball back in an act of sportsmanship. The fullback's 60-metre punt bounced up and over Spain captain Iker Casillas [ ], forcing the startled keeper to leap and tip it to safety. The game continued with frequent stoppages and few chances, until Wesley Sneijder [ ] split the Spanish defence with a perfectly-weighted ball into the path of Arjen Robben [ ] after 62 minutes only for Casillas to save brilliantly with his feet. In a lively end to normal time Villa had a shot blocked in front of the line, an unmarked Ramos headed wildly over the bar from five metres out and Puyol [ ] was lucky to escape punishment after hauling down a furious Robben. In extra time it was Stekelenburg's turn to save with his feet when substitute Fabregas was sent clear by Iniesta. Netherlands had to play with 10 men for the last 10 minutes of extra time when John Heitinga was sent off for hauling down Iniesta on the edge of the box. The little midfielder got back on his feet and soon after was celebrating scoring the winning goal in the World Cup final to send the delighted Spanish fans into raptures. © Copyright 2010 Reuters Limited. All rights reserved. Republication or redistribution of Reuters content, including by framing or similar means, is expressly prohibited without the prior written consent of Reuters. Reuters shall not be liable for any errors or delays in the content, or for any actions taken in reliance thereon.